Members Must Log In to Access Discount. Corporate Members contact Trish Giaquinto for corporate concierge registration. For offline registration, please use this fillable form. 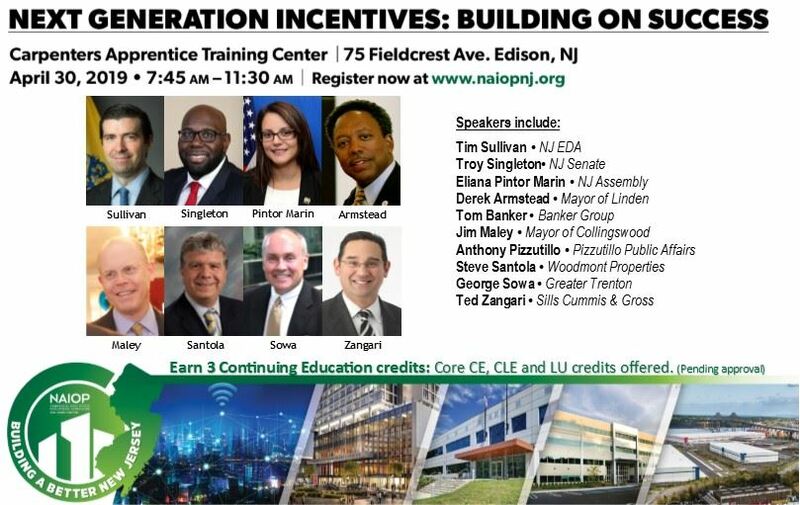 Part of NAIOP NJ's Building a Better NJ series, this program will offer up to three education credits for NJ licensed brokers (core), Attorneys, and Architects. Registration/Networking breakfast begin at 7:45 AM followed by the program at 8:30 AM. Directions to Carpenters Apprentice Training Center. Cancellation policy: By registering for this event, you agree to our payment and cancellation policy. Non-members must pay in advance. Refunds will not be given on registrations canceled within three business days of the event. If you must cancel, please submit your cancellation in writing to giaquinto@naiopnj.org. Only cancellations submitted in this fashion and at least 3 business days prior to the event will be honored. NAIOP NJ (@NAIOPNJ) is a not-for-profit trade association. Every dollar you invest with NAIOP NJ supports the promotion and protection of the commercial real estate industry in New Jersey. Online sales are not available for this event: For Gala Journal, Gem Sponsors and ticket availability, please contact Donna Laterza at 732-729-9900. 08 Jun 2015 Chapter Meeting: What's Driving Real Estate Development? 08 Apr 2014 Chapter Meeting - Health Care: Rx for Vacancies? 17 Dec 2013 DL Mixer "Ugly Sweater Party"
17 Oct 2012 Advanced Ethics for Commercial Real Estate Brokers/Salespersons: 1 Broker Core CEU Pending for this FREE NAIOP Program! 27 Mar 2012 Office, Industrial, Mixed Use: Where is the Smart Money Going? 24 Jan 2012 Annual Meeting & Forecast: Earn CEUs!